Assuming that you are familiar with Google Cloud Messaging, the new word for you in the title “FirebaseCloudMessaging” or “FCM” is Firebase. In case you don’t know about Firebase, let me give you a brief idea about it. 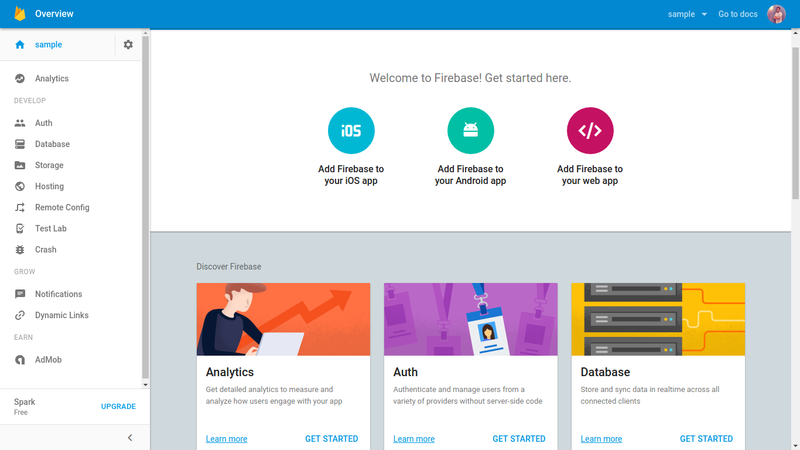 Firebase is a cloud service provider, provided by Google, which provides Mobile backend as a service (MBaaS), also known as “backend as a service” (BaaS). Using Firebase, you can quickly sync up your data and make it available it on your app, which is being used by multiple users. Now, since it is being used by multiple users, how does Firebase individualizes multiple users? Here comes the role of “authentication” (mechanism of providing identification to each user) by Fireabase. Since authentication plays a vital role while sending push notifications, let me brief you about it as well. What is authentication and role of FireBase in it? Generally applications need to know the identity of their user. Being aware of user’s identity allows android apps to provide them a customized experience and grant them permissions for accessing their data. This process of proving a user’s identity is called authentication. Firebase provides a full set of authentication options. Information about the user is returned in callbacks on the client device. Using this we can customize our app’s user experience, according to a specific user. This user information returned contains a UID (a unique ID), which is distinct across all providers, and it never changes for a specific authenticated user. Now, in our app’s security & Firebase rules, value for the authToken becomes defined. Its value will be null for unauthenticated users. However, for authenticated users, it will an object containing auth.uid (unique for every user) and some other informational data about the user. Using this, we can securely control data access on a per-user basis. Send notification messages (2KB limit) or data messages (4KB limit). Distribute messages to a single device, groups of devices, or to devices subscribed to some topics. Send acknowledgments, chats, and other messages from devices back to the server over FCM’s reliable and battery-efficient connection channel. Using Notification messages, developers can send users a visible display message with some predefined keys and optional custom key-value pairs (data payloads). Apart from this, what more Google has to say about FCM? 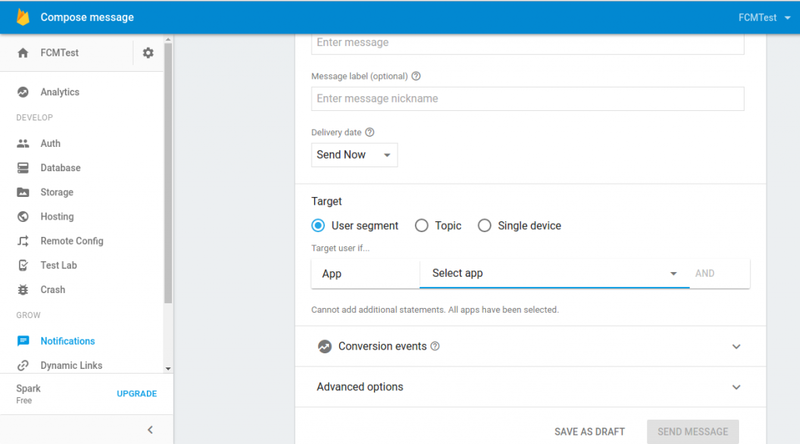 Firebase Cloud Messaging(FCM) is the new version of GCM. It inherits the reliable and scalable GCM infrastructure, plus new features! 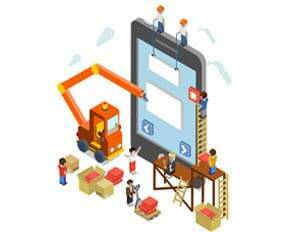 If you are integrating messaging in a new app, start with FCM. GCM users are strongly recommended to upgrade to FCM, in order to benefit from new FCM features today and in the future. As you can deduce from this statement, Google is investing strongly in Firebase, to make it one unified mobile platform. How is FCM similar to GCM? Both can be used to send messages to multiple platforms – Android, iOS, and Chrome, as their core structure is same. How is FCM different from GCM? Unlike GCM integration, we don’t have to write our own registration or subscription retry logic. We no longer have to explicitly declare “Receiver”. Generation of registration token is handled by the library itself. We don’t have to initiate it explicitly. It provides server-less notifications solution with a web console – Firebase Notifications. This web console will remind you of Parse Push Console (if you have used it). So is GCM going to be deprecated? No. However, some features of GCM are already depreciated. Like – Obtaining Registration Tokens with gcm.register() is deprecated now. So, in coming days some other functions may also get depreciated. However, they will support the current version of GCM Android and iOS SDKs. All new client-side features will be added to FCM SDKs only. A device running on Android 2.3 (Gingerbread) or newer version, along with Google Play services 9.2.1 or newer. Android Studio 1.5 or higher version. Go to Firebase console and either create a new project or import an existing one. After creating or importing your project, a welcome screen will open; like below. 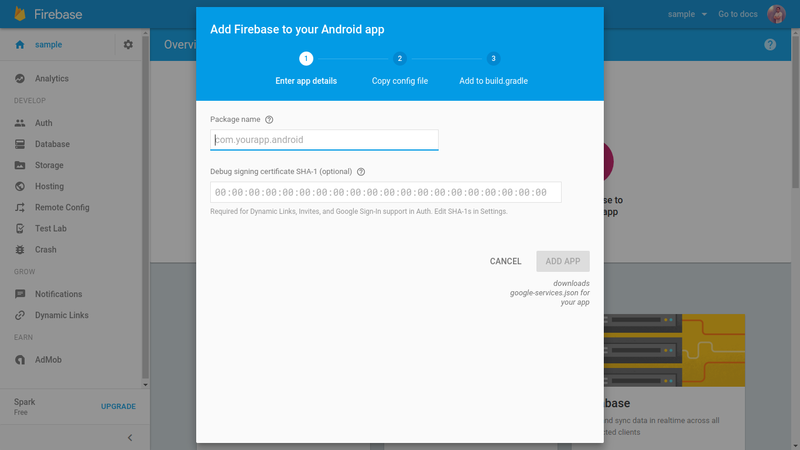 As I’m into Android, I’ll be adding Firebase to my Android app. However, steps for Android, iOS and Web app are almost same. Click on Add Firebase to your app. It may ask for keystore password: Type “android” if using debug.keystore. After entering required information click on Add App. Now it’ll ask you to save downloaded google-services.json file. Save it in the root of app folder of your app. Next, you’ll be asked to add the following dependencies to your gradle file for accessing Firebase SDKs. Click on finish and you are done. 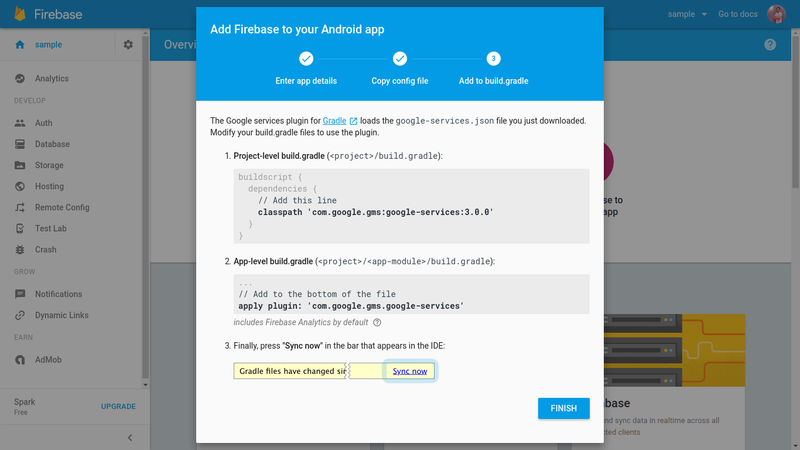 Firebase is added to your app now. Now let us first understand how Firebase works ? Since, you have understood by now how FCM works, lets begin some coding. message handling beyond receiving notifications on apps in the background. 3. Now we need to add a service that extends FirebaseInstanceIdService. This is the Base class to handle Firebase Instance ID token refresh events. This FirebaseInstanceIdService extends Service class. Allows devices to subscribe to various topics with the server subscription management API. Now create the respective service classes in your Android code. If you have specific need to retrieve current token call call FirebaseInstanceID.getToken(). It returns null if the token has not yet been generated. console . 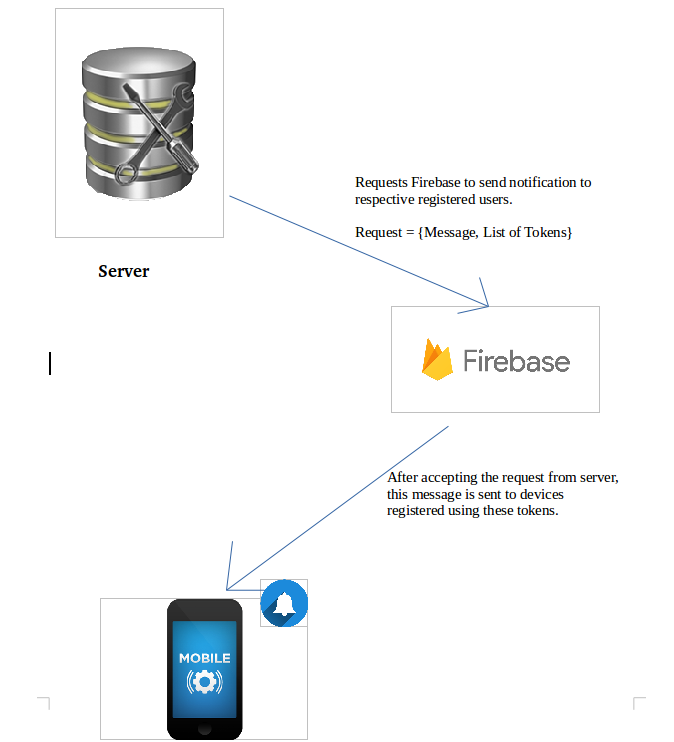 (Downstream messages means sending messages from your app server to Firebase Cloud Messaging client apps). However, lets skip that part for now. Let us first understand how to handle received messages on client side, otherwise some users may not receive the notifications we send. This includes any users who have your app in the foreground on the device. Notifications delivered when your app is in the background – In this case, notification is delivered to the system tray of the device. A user’s tap on a notification opens the app launcher by default. Messages with notification + data payload - In this case, the notification is delivered to the device’s system tray, and data payload is delivered in the extras of the intent of your launcher Activity. This is also called if any notification message is received while user is interacting with the app i.e. app is in the foreground. To fetch notification parameters use getNotification() method.If we need to perform some action based on the message received and access message data, we will have to override this method. How to send a message from the FireBase console? Select the message target (devices). The dialog displays further advanced options to filter the target devices by allowing you to choose from App Version, Users in Audience or Device Language. Once you click Send Message button, client devices you targeted, that have the app in the background, will receive notification in the system notifications tray. Whenever the user will tap on the notification, the app launcher will open up your app. If you want to send a message to a particular device: select “Single Device” from options available and insert the token you received. Normal priority – This is the default priority for message delivery. These messages do not open up network connections if your device in is “Doze mode”, and their delivery is delayed to preserve the battery. High priority – FCM delivers high priority messages immediately, permitting the FCM service to wake a device which is in “doze mode” when possible and open a network connection to your app server. Apps which have features like instant messaging, chat, or voice call alerts, generally need to open a network connection to make sure that FCM delivers the message to the device without any delay. Set messages to high priority only when your message is time-critical and it requires immediate response from the user. However, keep in ind that setting your messages to high priority contributes more to battery consumption compared with normal priority messages. Handling of messages when app is in the background. These messages are displayed automatically when the app is in background. These are delivered to the notification tray . When the user taps on the notification, it opens up the app launcher, which is default process. This also applies for messages that contain both notification and data payload. 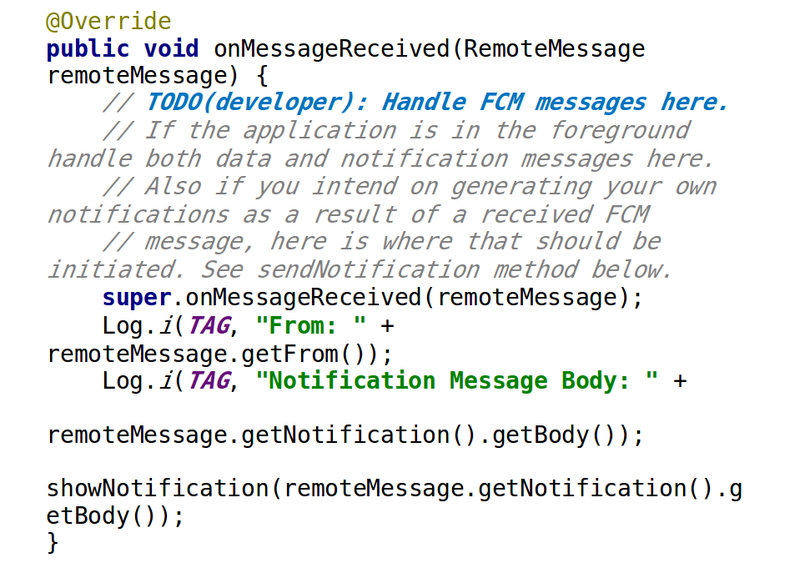 However, If the app is already in foreground only then FirebaseMessagingService.onMessageReceived() is called. These messages are also automatically displayed when the app is in background and FirebaseMessagingService.onMessageReceived()is not invoked. These are delivered to the notification tray . If the app is already in foreground, only then FirebaseMessagingService.onMessageReceived() is called. In this case, data message are received in onMessageReceived() and client can handle the key-value pairs accordingly. Firebase team have developed a UI to send data-messages to the devices. However, this data could not be received at your end. Hence, firebase console should not be used for data-messages. So, if you want to process the messages arrived in the background, you have to send ‘click_action’ with message. click_action is a parameter of the notification payload. However, it is not possible while sending messages from Firebase console, but only via Firebase API. click_action indicates the action associated when the user clicks on the notification. If this is defined, then the activity with a matching intent filter is launched when user clicks the notification. 6. Click on Send Button. You’ll receive message with data payload. You can access this data in the onCreate() of your respective Activity. How to upgrade from GCM SDK to FCM SDK? do i have to upload the app to google play prior sending notification or i can test it in debug mode ? Indeed you can test it in Debug mode. You can test it in Debug mode. Just follow the process mentioned above. You can test it in debug mode. Please read the blog, it’ll help. How to send Notification From Device [A] — FCM Server —- Device[B] please send the Code also. Do we have FCM integration steps with Cordova 5.x – Ionic 1.5? Is FCM reliable in Real-time situation or is it sloppy like GCM? Is there any Third party Notification Provider with FCM? Yes, try Googling and you’ll find the steps. No, Real-time delivery of FCM is doubtful. Not as of now. Moreover, generally third parties internally implement GCM or will migrate to FCM only. Then why to go for third parties? I would suggest you to go for implementing FCM and let me know if you face any issue. I want to develop a chat app similar to feature that whatsapp have like typing and online. So, should I go for FCM or XMPP. ? Definitely XMPP. No doubt about that. WhatsApp uses Ejabberd (XMPP) server which facilitates instant message transfer between two or many users at any given second. FCM is a cloud which stores your messages prior sending. Even if your app is not running cloud saves your messages and send them as soon as your device got connected to internet.If you just rely on FCM to deliver the payload you can’t track the delivery of messages as easily. Real-time delivery of FCM is also doubtful. Thanks for the Post. Its very easy to understand. thanks alot for this awesome post…. I have implement your server side code with Java. Its working in windows but not in linux. Any idea? It should work. Its OS independent. Please re-check your implementation. Thanks for this post. It is awesome. 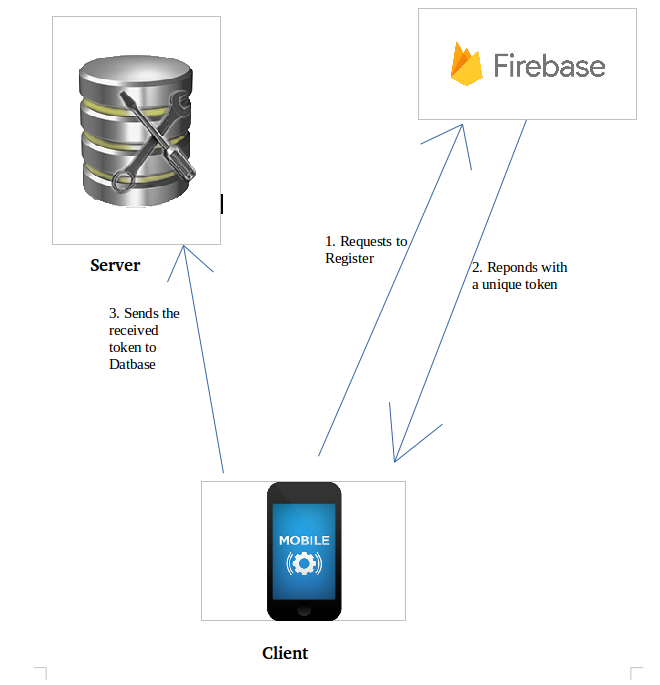 This post helps me understand more about firebase messaging. I have a question when the app is in the background, we use FirebaseAPI with the body. We send the message to the device that matching registration token. How to send the message to all devices? could You send me your detailed source code in fcm notification. To send messages to all the devices, just remove – “to”: “”, from the firebase API body. This will allow to you to send messages to all the registered devices.